Percy Jackson never asked to be a half-blood: half boy, half Greek god. He’s gone from playing basketball to battling monsters, struggling to stay alive. Now it’s the last Friday before the winter holidays, but Percy Jackson isn’t relaxing: he’s busy battling the fearsome Manticore (half human, half lion), and that’s just for starters. Winter is coming, Annabeth is missing, and Artemis, the goddess of the hunt, is being held captive. Along with Grover and Thalia, the daughter of Zeus, Percy sets off on a quest to rescue Artemis and Annabeth. 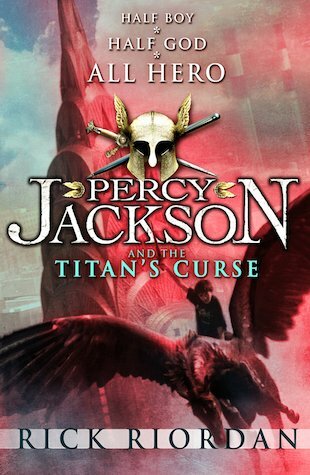 But with a new storm erupting in the kingdom of the gods and a sinister prophecy from the Oracle hanging over them, will Percy and his friends stay alive long enough to see the spring? you can’t stop. The series is so addictive. Love this book. Especially nico and his mythomagic. At the end of the book Percy has to actually hold up the sky! This is a great book using the real world but mixed with a fantasy world absolutely perfect. Rick Riordan is blockbuster author of the best-selling Percy Jackson books, The Kane Chronicles and the Magnus Chase series. Rick won the Askews and Red House Children’s Book Awards for Percy Jackson and the Lightning Thief in 2006, and was named the US Children’s Choice Author of the Year in 2011.